The popularity of tea is worldwide, but nowhere in the world does tea contribute as much to the cultural milieu as in Japan. There the preparation and drinking of tea has acquired esthetic significance and has developed into a distinct artistic accomplishment. The following brief history outlines the events that resulted in this simple yet deep cultural practice. One of the earliest treatises on tea drinking dates from eigthth century, The Classic of Tea written by Lu Yu (d.786). The influence of this book may be seen in the subsequent Tang (818-907) and Sung (960-1279) Dynasties where a flourishing culture included the widespread drinking of tea. Japanese scholar-priests, such as Saicho (727-822) and Kukai (774-835) who had travelled to China on cultural missions, most likely brought the first tea seeds and tea drinking practices back to Japan. The first record of tea drinking in Japan occurred in 815 when the Emperor Saga received tea at Sufukuji Temple while on a journey. A few poetic anthologies from the same age also mention the drinking of tea. The Tang period method of tea preparation is what is known as brick tea these days. The leaves are steamed, formed into a hard, dried shape, and then shaved into boiling water with seasonings. The method appears not to have agreed with Japanese taste because no further records refer to tea for about two hundred years. Tea seeds were reintroduced to Japan by another returning scholar-priest Eisai (1141-1215), along with the teachings of Rinzai Zen. He wrote a treatise named Kissa Yojoki, praising tea for fostering both physical and spiritual health, and thus tea drinking again was embraced by Buddhist priests as well as by their wealthy patrons. The seeds, planted first in Kyushu and then in the mountainous Togano-o region west of Kyoto, eventually produced tea plants that were cultivated throughout the central provinces. Tea from Togano-o retained a reputation for flavor and quality indicated by its designation honcha, that is “original tea,” or “real tea.” The Sung Dynasty method of tea preparation that Eisai brought to Japan involved the powdered green tea that we know today. While the precise gestures used to make the tea are not known, the utensils are; a kettle and brazier, a Temmoku teabowl on a lacquered stand, a bamboo whisk. In Japan drinking powdered green tea was practiced largely in Zen temples where, in addition to its acclaimed medicinal properties, the manner in which tea sharpened mental and physical acuity assisted the monks in their long hours of study and meditation. As menioned earlier, tea drinking also occurred in the secular reception rooms of the temples’ powerful patrons. At first these gatherings were occasions to experience and appreciate Chinese culture, in which tea drinking played a role similar to that in Zen temples. Later, however, as the political and economic stability of the country deteriorated, tea drinking was taken as the basis for a luxurious amusement. Tea tasting contests challenged participants’ ability to distinguish Togano-o “original tea” from other varities (hicha or “non-tea”), and were accompanied by rampant gambling, feasting, and drinking of wine and tea. However the political and economic situation worsened and Japan entered the period known as the Hundred Years of Civil War (Sengoku Jidai, 1482-1558), this type of frenetic recreation faded away. A more contemplative removal from the chaotic world gained favor, typified by gatherings hosted by the eighth Ashikaga shogun, Yoshimasa (1436-1490). Within a small, four-and-one-half mat room on his Ginkakukji estate, Yoshimasa sought for consolation, and perhaps illumination, through the arts. He gathered around him the foremost men of culture of the time, renowned among them Noami (1397-1471), his son Geiami (1431-1485), and grandson Soami (d. 1525). Noami is said to have conducted elegant tea gatherings for Yoshimasa, utilizing the extensive Ashikaga collection of works of Chinese art, and to have introduced Yoshimasa to the innovative teamaster, Murata Shuko. Murata Shuko (1423-1502) entered a temple in Nara at a young age but left temple life for reasons not fully understood. At some point he met the iconoclastic priest Ikkyu (1394 - 1481) from Daitokuji temple under whom he is thought to have studied. 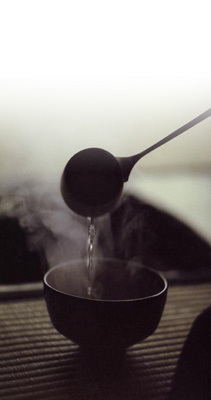 Ikkyu encouraged Shuko to consider that the same spirit prevails in both Zen training and the mastery of Tea. Thereafter Shuko applied himself to this principle. He is the first to have included in the responsibilities of the host the physical act of making tea for the guests. Two written documents are associated with Murata Shuko. First is the “Dialogue with Shuko (Shuko Mondo),” reportedly a conversation on tea practice between Yoshimasa and Shuko. In it Shuko says that upon entering the tearoom, all discrimination betwen self and other vanishes, a spirit of gentleness prevails, and that peace may be attained when modesty, respect, purity and tranquility are understood. War continued to rage thoughout the country, although the city of Saki maintained a position of relative peace and safety. Shuko’s tea practice, which appealed greatly to the commoner class from which he hailed, flourished in this city of merchants. The name of one man in particular, Takeno Joo (1502-1555), remains as inheritor of Shuko’s tea, though study with Shuko’s pupils Sochin and Sogo. Before coming to tea practice, Joo studied linked verse (renga) and the way of incense (kodo), traditions handed down within court culture. He combined the values from courtly traditions with Shuko’s interpolation of warrior and Zen traditions, which had informed tea practice, to move “thatched hut tea” one step further, to the aesthetic known as wabi. 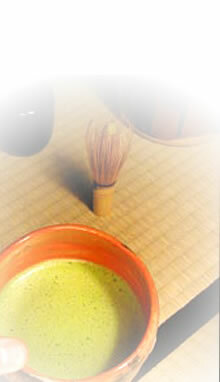 Tea practice became de rigeur for Sakai merchants. Among them was an exceptional young man later known as Sen Rikyu (1522-1591). Initially he studied the elegant tea traditions of the ruling warrior class under Kitamuki Dochin (1504-1562). At age nineteen he began to study with Takeno Joo. Once again traditions and interpolations collided. The greatest influence on Rikyu’s tea was his study of Zen, leading to an emphasis on the immediate and on non-duality. One of his pupils likened Rikyu’s tea practice to a tree in winter, and said he made mountains into valleys and low into high. Rikyu himself turned, like his teacher Joo, to poetry to describe his views on wabi, “To those who long only for flowers in full bloom, I would show the spring of young shoots pushing through snow in a mountain village” [by Fujiwara Ietaka]. Among the best known of Rikyu’s innovations in tea are the “crawling in” entrance to the tearoom, which eliminates distinctions of rank or class among those who enter, the use of barely modified natural objects like bamboo and gourd vases, and the liminal beauty of Raku teabowls. Rikyu served as one of the “three under heaven” tea masters to the military rulers Oda Nobunaga (1534-1582) and Toyotomi Hideyoshi (1536-1598), a position of great renowned and prestige but not without peril. At age seventy, Rikyu incurred the displeasure of Hideyoshi and was ordered to end his life. Rikyu’s pupils ranged from daimyo lords to town merchants. However in the succeeding age, the overwhelming impression of tea practice is of daimyo tea. Furuta Oribe (1544-1645), one of Rikyu’s pupils, and Kobori Enshu (1579-1647), a pupil of Oribe, did much to shape daimyo tea, establishing more mannered expressions of creativity and returning to a sense of priviledge and ornamentation that had characterized tea drinking in the time of the Ashikaga shogunate. This did not mean that wabi tea disappeared. The tea practice pioneered and refined by Shuko, Joo, and Rikyu lives on in this esthetic which is embraced by all those whose hearts incline towards tea, whether or not they actively study. In particular Rikyu’s practice of tea flourishes in the dedication of his descendants to the Way of Tea. The Urasenke Tradition of Chanoyu, headed by Zabosai Genmoku Soshitsu, sixteenth generation descendant of Sen Rikyu, is among the largest and most active of present day traditions.